The biggest difference that I have to offer from what might be found in other sources, is the substitution of plywood for the spine and base plate, instead of using lumber. 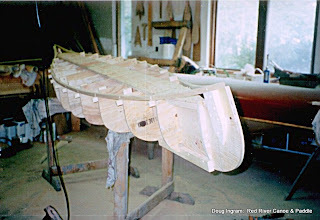 My first canoe mold used lumber 2 x 8's for this, and It was a chore to accommodate for the inevitable tendency for that lumber to twist. Plywood won't do that, so its more predictable. Building the mold is complicated enough without having to deal with that, too! After the necessary allowances are made for material thicknesses, 2 plywood components are made using 3/4" plywood. Building the mold is an investment piece of work, so you should choose good quality materials. This is not the time to be cheap, its a false economy. 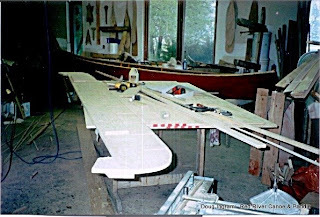 Start by making a baseplate that runs the length of the canoe. The maximum width is not critical, but the minimum is. 8" is a pretty good width.. A wider baseplate provides a nice stable base for the mold to sit on. The baseplate is two thicknesses of the 3/4" plywood. The bottom one is full width, the top has a 3/4" wide slot running the full length. Set a perfectly straight line on the face of the bottom plate, and glue and screw the top aligned to the this reference line. This will ensure that the canoe mold is built straight. 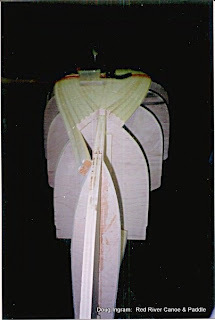 The other major component to the mold structure is a spine made of 3/4" plywood. 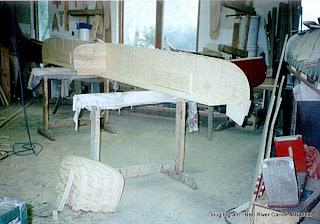 This spine is made to the same reductions as each station mold, and it runs the full length of the canoe. Some builders choose not to have the spine support the stems. I'm in the camp that does. I build in the Chestnut/Peterborough tradition, and running the stem mold full length facilitates the type of joinery for the stem-gunnel area that is used in this approach. The 8' plywood piece will not run full length, a simply but joint with blocks on either side will suffice.. Ensure that the bottom of the spine is perfectly straight. This is a major reference line. Set the station spacings on the spine and draw plumb lines at the required intervals, indicating which side of the line the stations will be placed. Draw a lengthwise line along the spine, about halfway up fro the baseplate. You will be cutting notches into the spine into which the stations will be set, this line establishes that the notches are cut uniformly. Cut the notches into the top of the spine The stations will have a corresponding notch cut into their bottom. The stations fit into the spine egg-crate fashion. Set the gunnel backers in position and secure them. At the stem end, make sure that they are well secured, and that they join in such a way as the gunnel end join can be made correctly. Draw out on paper beforehand, how you plan on making the gunnels join. This will ensure that you set the backers correctly for your planned build method. Start sheathing the mold with clear lumber. I like to use pine because it is so easy and pleasant to fair with hand planes. The thickness of the sheathing will have been established when you started planning the mold and made the deductions on the drawings. Use 3/4" square, or 7/8" square. Make sure that it is milled square so that it can take the twists of the mold without distorting. 3/4" is easier to work with than 7/8", but the 7/8" makes a stiffer sheathing when done. The first piece on is one 3/4" wide pieced down the center, just capping the plywood spine. This center piece ends where you determine where your stems will begin. The sheathing added after this will determine the slot for the stems. The next pieces on are the same thickness, but are cut from wider stock. Make sure that when you mill your sheathing stock that you leave two pieces at the milled thickness but not cut into strips! Run a batten lengthwise to establish a fair curve from the full width down to the sheathing strip width at the ends. 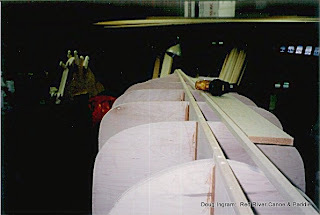 These pieces help accommodate for the changing girth of the canoe from center to end. As you put on the sheathing, make sure that you put screws securing each new strip to the one already on the form, this ensures that the sheathing skin is much stiffer inbetween the stations. This is an issue because of all the hammering that will take place on the mold during the actual construction of the canoe. So there you have it. More detailed information is available in the book "The Wood & Canvas Canoe" by Rollin Thurlow and Jerry Stelmock. After I started using plywood for the spine and baseplate, I learned from Rollin that he has gone over to plywood, too. Posted by Doug Ingram at 8:29 a.m.